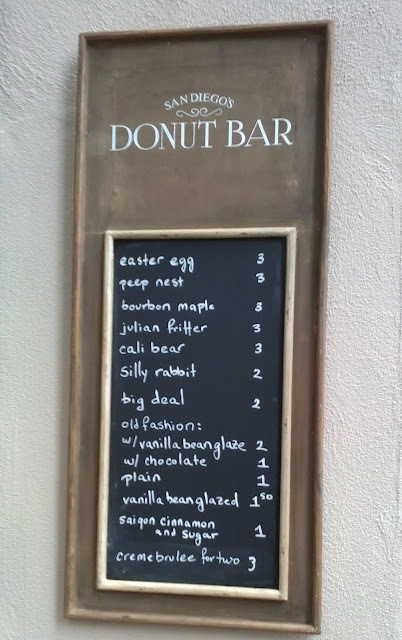 After the opening of Swoon Dessert Bar, the grand opening I was most looking forward to was Donut Bar. 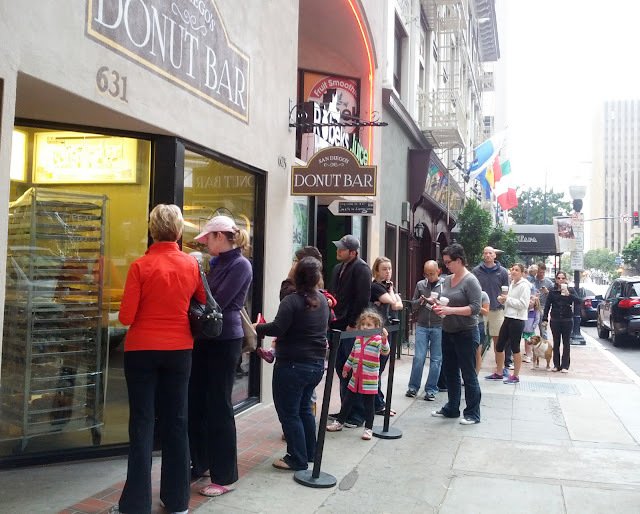 I obviously was not alone in my excitement over promises of high quality donuts, since the donuts at Donut Bar have been selling out early on most days since its debut. 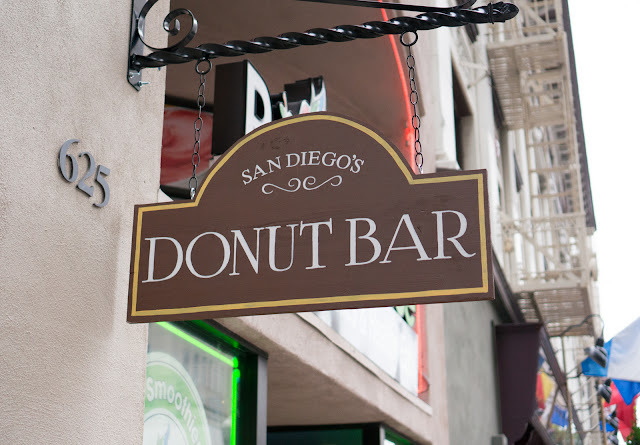 On its opening day, owner Santiago Campa seriously underestimated San Diego’s desire for good donuts. 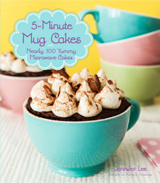 They baked less than their normal amount and sold out within half an hour. 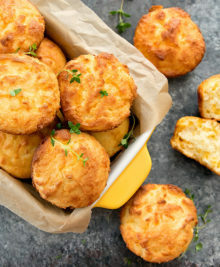 When I arrived at 9am (an hour after opening), all that was left were mini buttermilk bites. 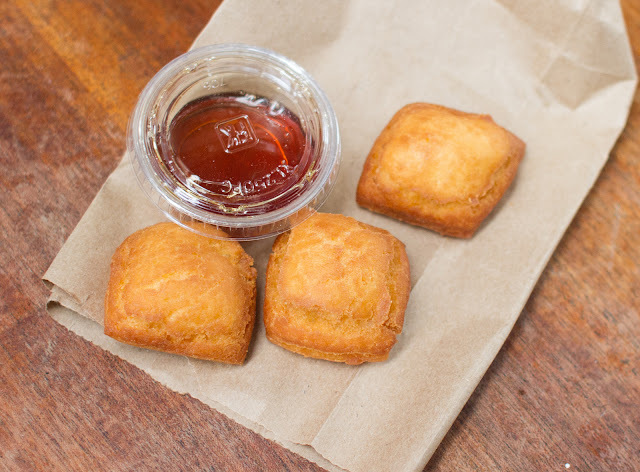 They were being offered 4 for $1, so we left with a small bag, accompanied by some syrup for dipping. 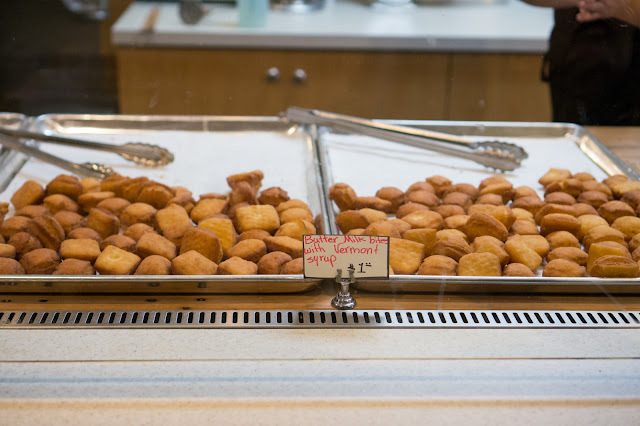 The buttermilk bites were light and airy, a hint of how good those donuts we missed out on must have tasted. The following weekend, we took no chances. I’d been following Donut Bar on Facebook, which they update regularly with their daily changing menu and status updates. 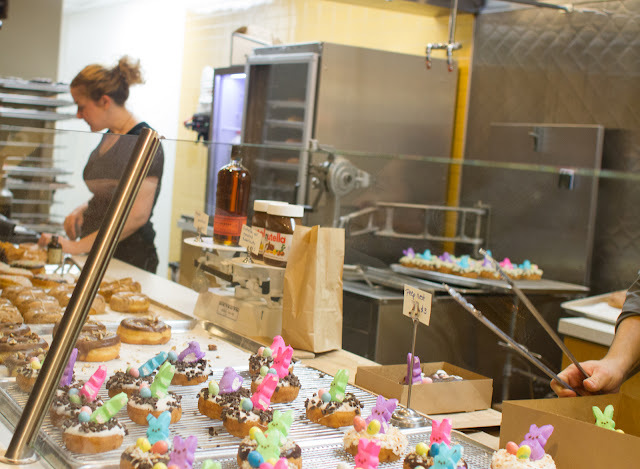 The Donut Bar aims to bake about 2,000 fresh donuts in the morning, open at 7am to feed the breakfast crowd, and close shop around 1pm. On most days during the first week, they were sold out hours before closing. On the following Saturday, we arrived 15 minutes before opening (they open 8am on Saturday so you can sleep in an hour more), only to find a line already formed. 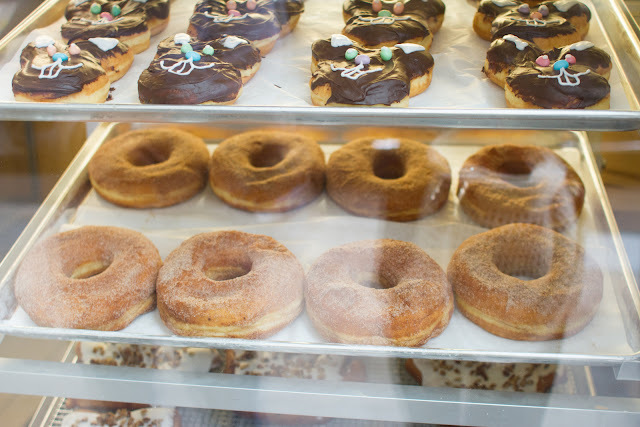 As we got in line, we passed by the glass window clearly displaying rows and rows of fresh donuts. 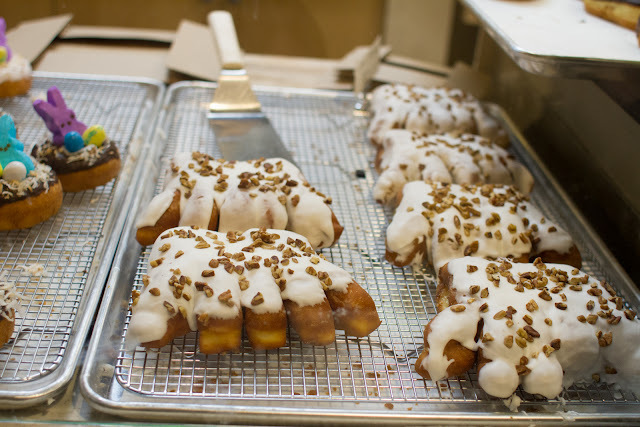 One of the things that sets this place apart is that they hand form all their donuts, which is quite impressive. 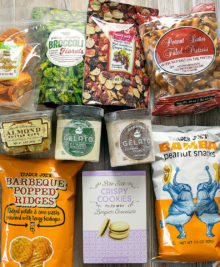 Once inside, I wanted to sample just about everything. We ended up purchasing more than two people should ever consume and left with two large boxes. In my defense, two donuts were being delivered to a friend. 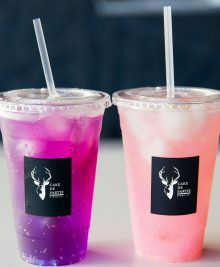 Also we wanted doubles of everything so that if we really really loved that one flavor, there’d be a second one. And by having doubles, we could devour one in the car and still have one left of that flavor to photo. I thought I took a solo shot of the Crème brûlée before biting in, but I guess not. I thought this was quite a unique offering and my favorite. 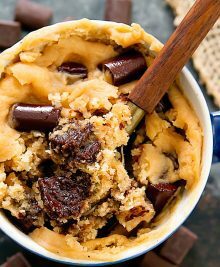 The outside glaze, which appears sticky, is actually hardened torched caramel that crunches and breaks when you bite in, much like the torched caramel on the crème brûlée dessert. 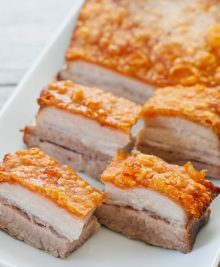 Each one was torched individually and were quite generous in size. 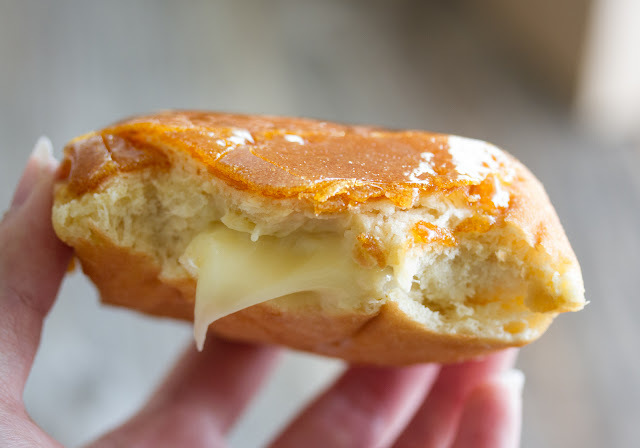 The very soft and fluffy donut is then filled with a vanilla custard pudding. The whole thing was quite sweet, but I still loved it. 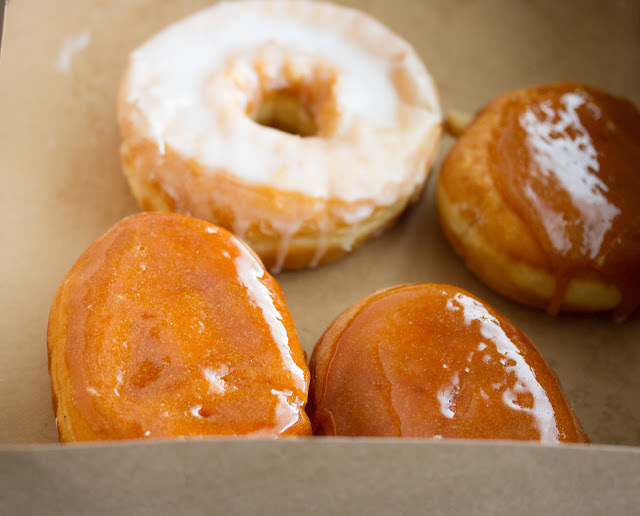 With all the different donut offerings out there, my favorite is still the traditional glazed. 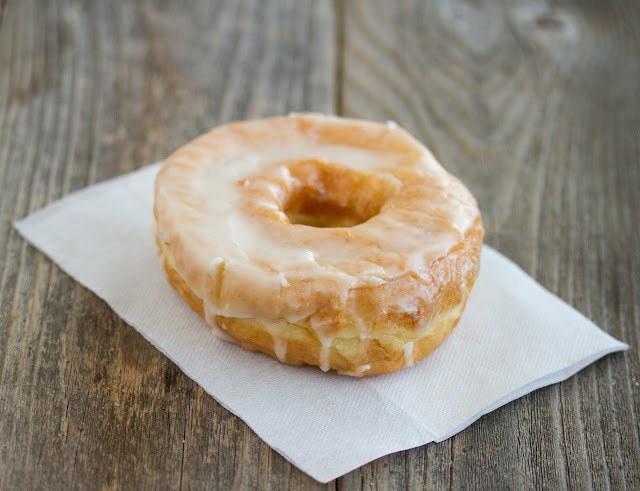 This vanilla bean glaze was simple yet perfect. 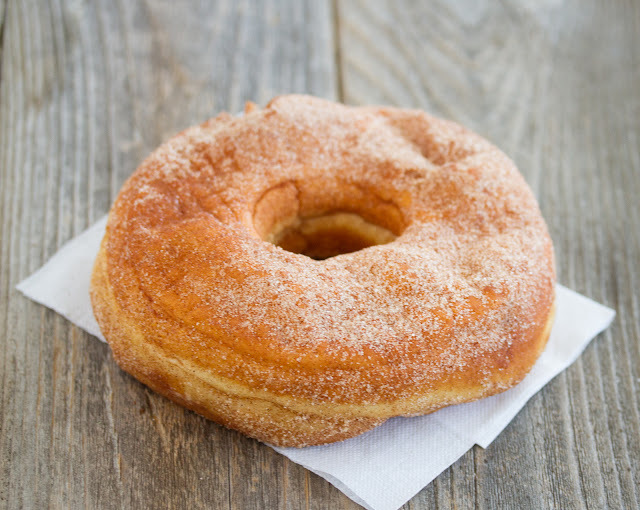 The dough had a very good rise to it, creating a light and airy donut. I wasn’t as big of a fan of this one. 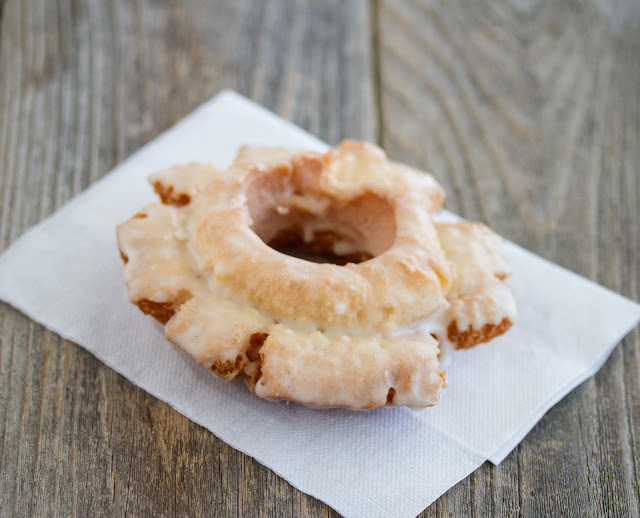 I thought the cake donut was a little on the dry side, though I did enjoy the hint citrus in the batter. At $3 a piece, I was a little disappointed to find the bourbon flavor barely detectable. We did wait a day to eat this one, so I wonder if the bourbon flavor would have been stronger if we ate it right after our visit. These cinnamon sugar donut rings were by far the largest donuts I’ve ever seen, and they are quite fitting of their name. 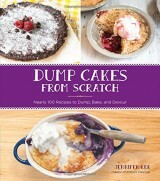 My one issue was that there was a little bit of raw dough in mine. I didn’t mind too much. 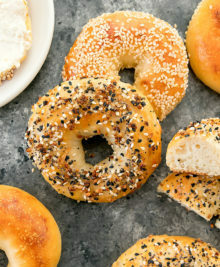 As someone who bakes and fries often, I know how hard it is to fully cook something so large without overcooking and it’s really difficult to tell if the dough is fully cooked. It was only small bits that were undercooked and we just ate around those pieces. Overall, we were very pleased with our visit to Donut Bar. The service was very friendly on both of our visits and I can understand why people have been lining up every day. While I do wish they offered donuts until later in the day, I can understand their reasoning for wanting to keep the supply and hours limited. 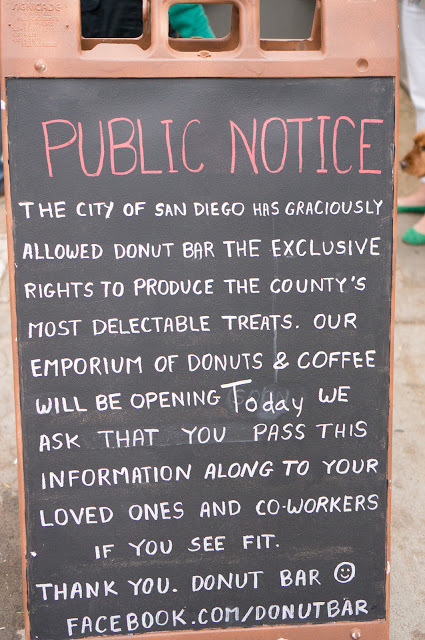 We’ll definitely be back to sample some more flavors soon and I’m so happy to see a good donut bar in San Diego. While you are there, you can also check out some artwork by Paul Horn. 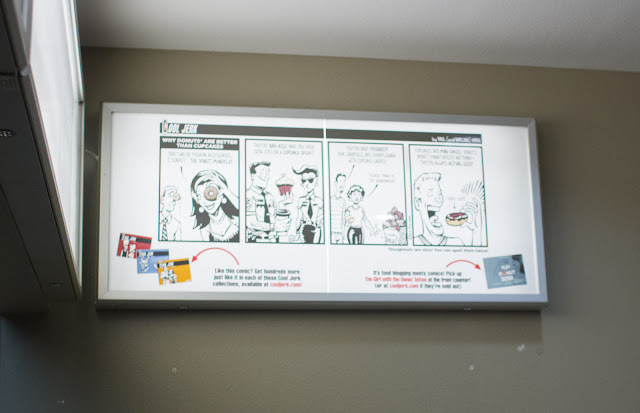 You can also read Darlene’s post on Donut Bar here. Donut Bar is open at 7am Mon-Fri and 8am on Saturday. They are closed on Sundays. 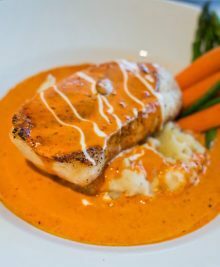 Daily menus are posted on their Facebook page. Hi Kirbie, we went on a couple of days after their opening and by 9:30 am, they only had 3 types of donuts left (old fashioned, chocolate euphoria and the pb & j bar w/rasp. jelly). the folks there were really nice but i was quite disappointed that they were sold out of many of their offerings that early in that day (c’mon, 9:30 am?). it would have been nice to sample a few other kinds. the standout for us was the pb&j bar, the other two were just all right. we did a trolley adventure that day with tc and her friend, so parking wasn’t an issue for us, but if i had to drive here, search for parking and go to this place and then find out only a few kinds were left, i would be $%#& irritated. i guess another (better planned, i.e. EARLY) visit would be in order to give this place another shot. hopefully they will live up to their hype. I think the problem is that people are buying boxes at a time, making them run out much faster. 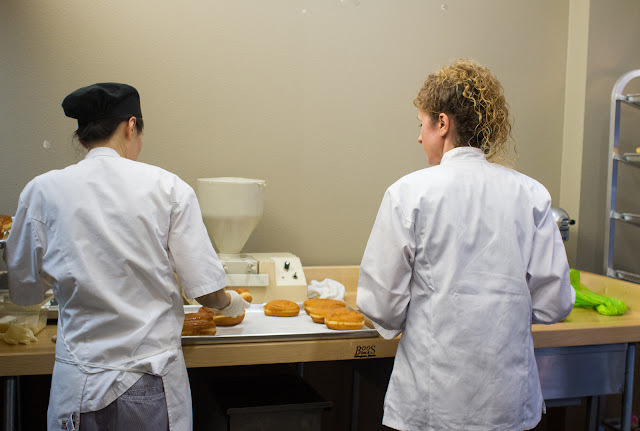 I can understand though that since they hand form the donuts, it takes longer and they want to preserve the high quality which is why they are limiting to baking only 2000 a day. I’m sure once the hype dies down, then people will go back to buying just one or two donuts and it won’t sell out as quickly. If you have some time on an early Saturday morning, we had no issue finding parking. I think weekdays might be harder since people work near there. Kirbie, if those donuts are anything like the ones here at “Boldy’s” in PA, then, no, it will not die down. You either get there on time or they are out…lol. 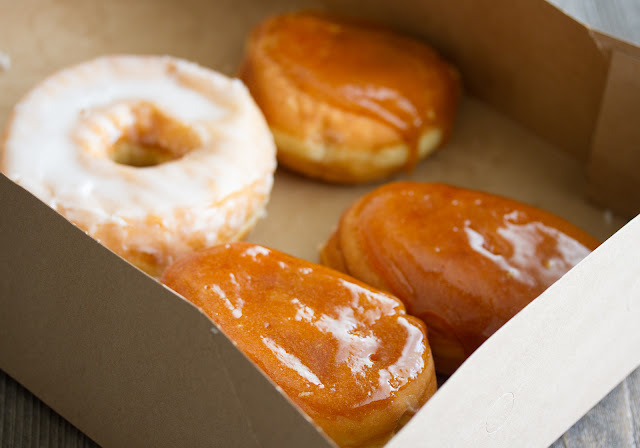 People drive miles to get the best donuts in the county and these were some of the best. I no longer drive, I heard that although the place was sold, it is still producing the best “goods in town”….LOL. 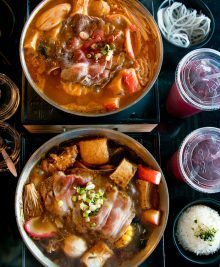 It’s been a few years since this place opened and it’s remained super popular and they’ve expanded too! I like your reasoning for buying more donuts than you should; it works for me! I used to work right across the street; it’s probably a good thing that I don’t now. 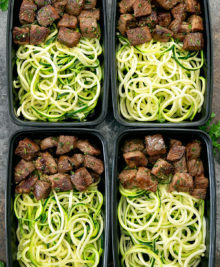 Oh man these look AMAZING!! 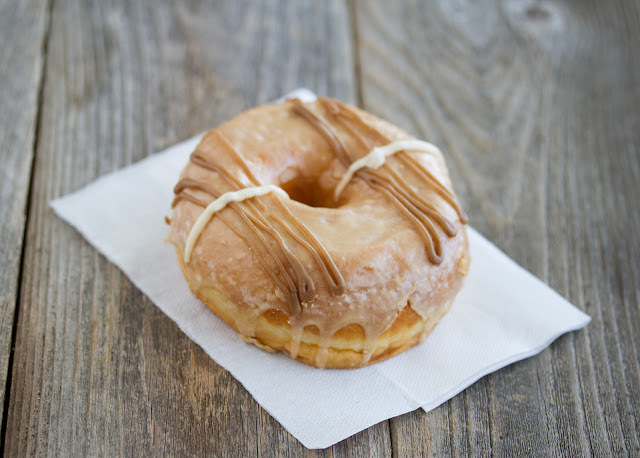 I also recently tried a Creme Brulee doughnut at a place in DC, and I love the crunchy sugar shell! I love the crunchy sugar shell too. Looks so pretty! The Dude and I were there on the same day as you! We showed up a bit later and missed out on the bourbon maple donut. 🙁 I have to admit, they do a basic chocolate glazed (the rabbit shaped) VERY well. Did you try the nutella? That was also divine. It was really difficult to choose a favorite. We’re actually planning to hit it up again this coming Saturday and bringing some more donut fiends/friends with us. Oh man…diabeetus. No I didn’t try the Nutella. I was debating whether to try it but I was a little more curious on the other flavors. 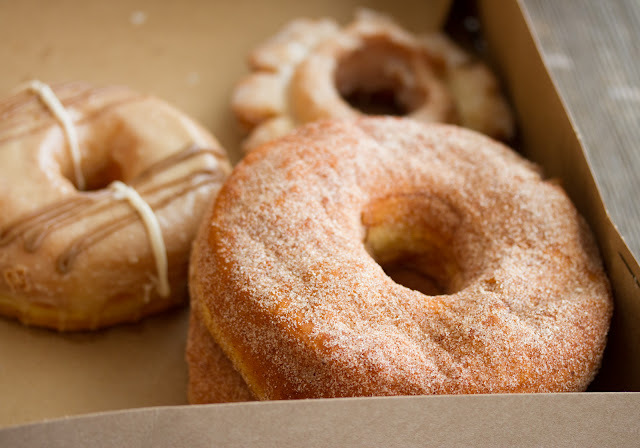 Wow, these look great but I’m sad that our local donut shops don’t get this much business. I still haven’t visited yet. My excuse is that I’m biding my time but really, we’ve just been busy on the recent Saturday mornings and haven’t had a chance to go in. 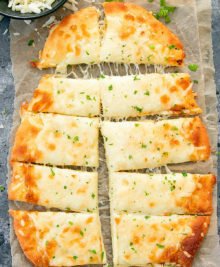 It looks really good though and I’m excited to try them still. I think once the hype dies down it should be more manageable (that’s what I’m hoping for at least!). I think so too. So it might be better to wait a bit, unless you want to get up super early. It’s definitely not something I do regularly, but I really really wanted to try those donuts! I agree that some of the donuts are a hit or miss for me. 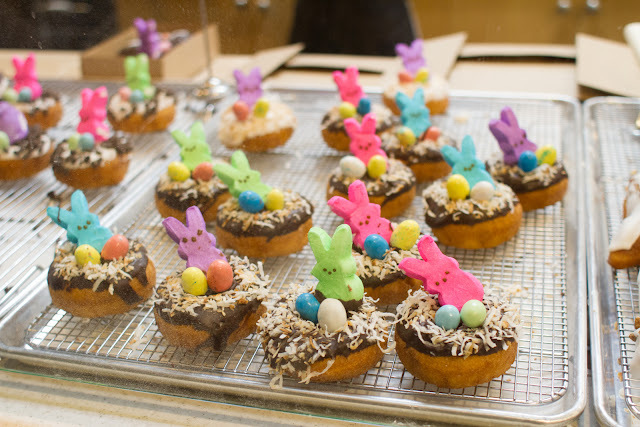 The one with Peeps looks festive but my blood sugar is surging just looking at it. 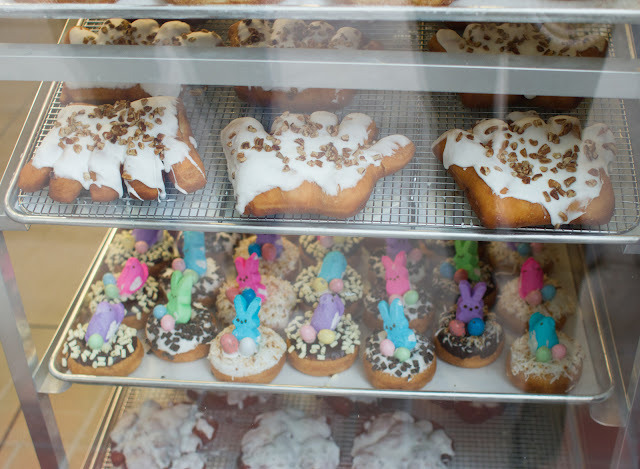 I believe Star Dust Donuts in Imperial Beach does everything by hand as well. Yes the peeps did look really festive. Though I like looking at peeps more than I like actually eating them so I passed on those. I still need to visit Star Dust. It’s been on my to-do list forever. I very much appreciate you bringing us those donuts recently, we really loved the creme brulee one. I wasnt so sold on the other one, but then I’m really not a huge donut fan in general. I would love to get down there just to check out paul and darlenes awesome artwork! I was happy to share the donuts!